Shaw and Co Solicitors UK have over 20 years experience in all aspects of Equestrian Law. Our expert Horse Solicitors have dealt with many claims for clients who have been injured by a horse, or injured working with horses. Compensation claims include Leisure Riding Accidents, Road Traffic Accidents, Livery Yard Accidents. 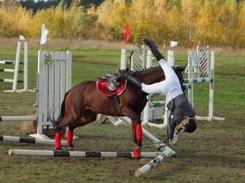 Horse Accident compensation claims are a specific area of personal injury, in which Shaw and Co Solicitors UK excel. With a long standing involvement in the Equestrian Industry, our breadth of knowledge regarding UK Equine Law and personal accident claims relating to equestrian accidents, is unique. Our Equine Law experts have a wealth of experience and expertise in equine litigation and equestrian legal agreements. If you have suffered a personal injury, as a result of an equestrian accident, have been injured by a horse or suffered injury working with horses, contact Shaw and Co Solicitors UK for a free no obligation consultation on Freephone 0800 0191 248. A horsewoman badly hurt when her mount was startled by an uncontrolled dog. Shaw and Co Solicitors UK recovered £30,000 in personal injury compensation for her horse riding accident. The rider was exercising a friend’s horse along a country lane when the dog rushed at her from a nearby cottage. Those involved with horses and horse riding will know from personal experience, word of mouth or from equine magazines that serious horse riding accidents sadly can, and do on occasion, happen. The UK Animal Law relating to liability for accidents caused by animals is complex. Shaw and Co Solicitors UK specialist Equestrian Solicitor, Mary Ann Charles, secured a considerable amount of personal injury compensation for their client, who had suffered a serious injury whilst training a horse. 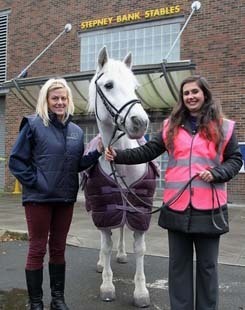 Visitors to a unique equestrian centre in Newcastle upon Tyne, will be riding safer - and warmer - in the saddle this winter. Staff at Byker’s famous Stepney Bank Stables have taken delivery of new clothing designed to make riders more visible in dark mornings and evenings and to keep out the cold.